Hello everyone, and welcome back!! 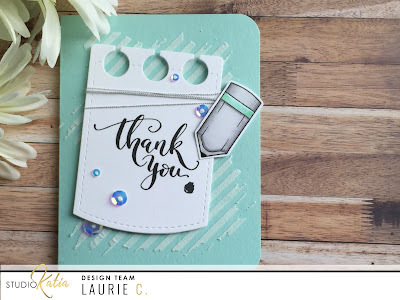 I have a sweet and simple thank you card to share with you for Studio Katia!! I knew I wanted to use the Stitched Notebook Set, that you can see already die cut on the bottom right. And I also knew I wanted to use the Teacher's Apple stamp set, especially for the pencil image!! For the sentiment, I chose to use the super sweet Mini Thank You set. FYI: this is a free with purchase stamp right now but will be available for sale in March!! I used my Winsor and Newton Promarkers to colour the pencil. In this case, I wanted it to look more like a pen so I coloured the "eraser" portion the same as the body. Because I am using a light blue base, I added a bit of colour to the strip across the top. Now here is where I got fancy!! 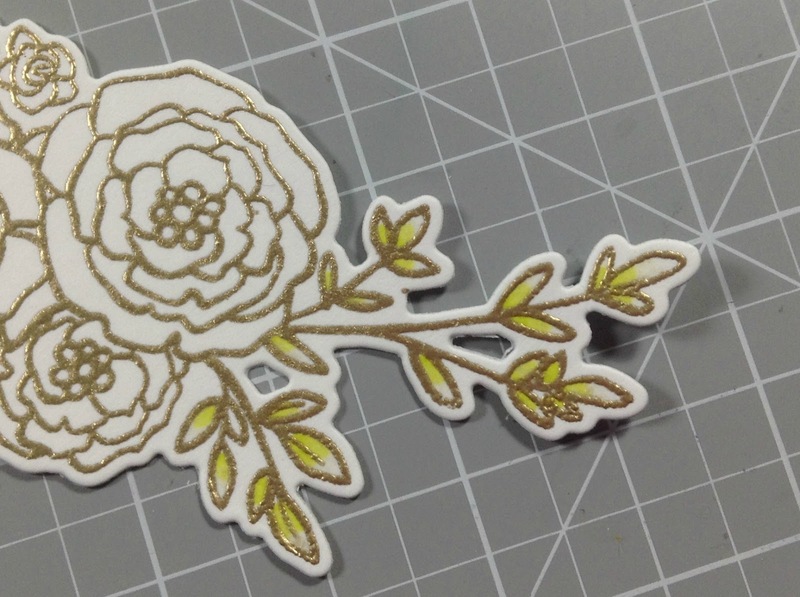 Embossing paste!! What??!! I never use this stuff, and I'm not sure why! I used a diagonal stripe stencil and applied the paste over top, in a messy way. And because the layer was thin, it dried super fast!! 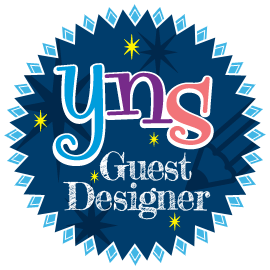 To finish things off, I added a ink blob just below the thank you using the awesome Brush Strokes stamp set. I tied a very thin piece of thread around the top of the notebook die and adhered the "pen" so it looked like it wrote the sentiment. I also added some sequins from the Crystal Clear Sequin Fusion mix. Hi peeps!! I wanted to pop in to share my latest project for Honey Bee Stamps!! 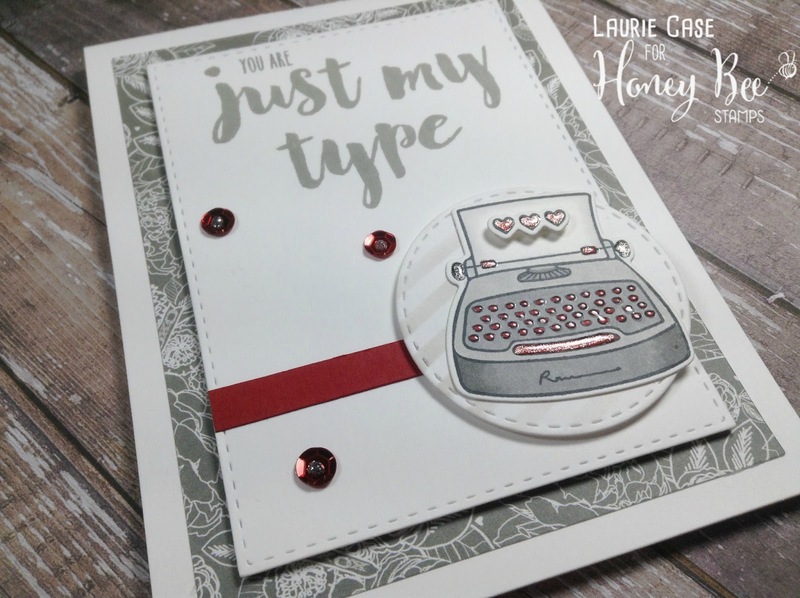 I love creating custom sentiments with Alpha stamps sets and the Brush Grunge Alpha Set is one of my all time faves!! In this one set you get upper and lower case letters, punctuation AND some small images including an awesome splat image!! Real bang for your buck!!! I also used the Just My Type mini stamp set along with its Co-ordinating Dies!! Please visit the HoneyBee Blog for ALL the details!! Thanks for the visit!! Until next time...hugs!! Hello and happy Wednesday!! 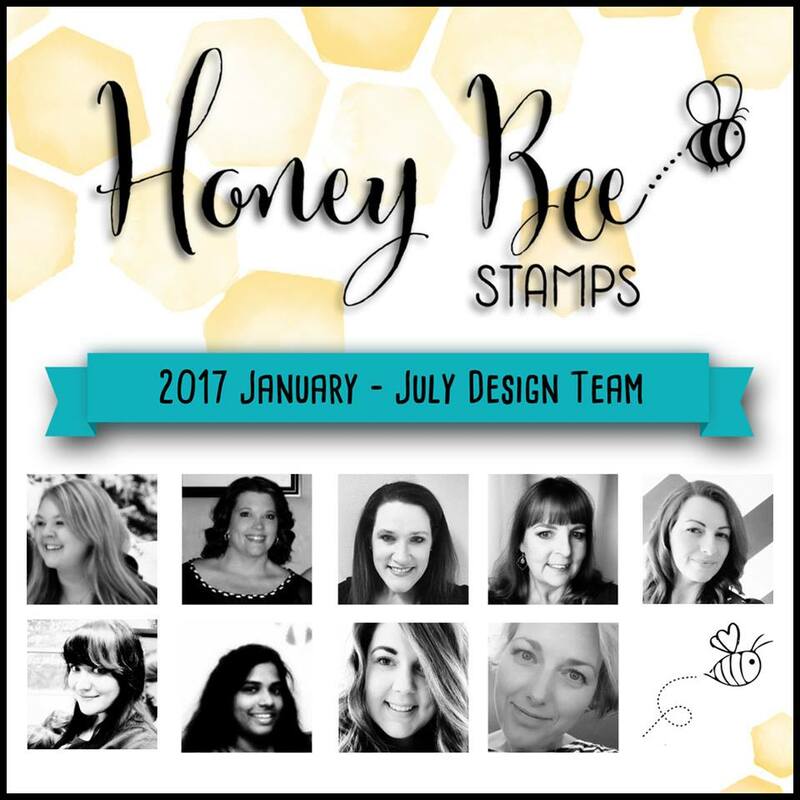 I'm popping in today to share my DT project for HoneyBee Stamps!! This is a card with quite a bit of die-cutting and a little bit of colouring. 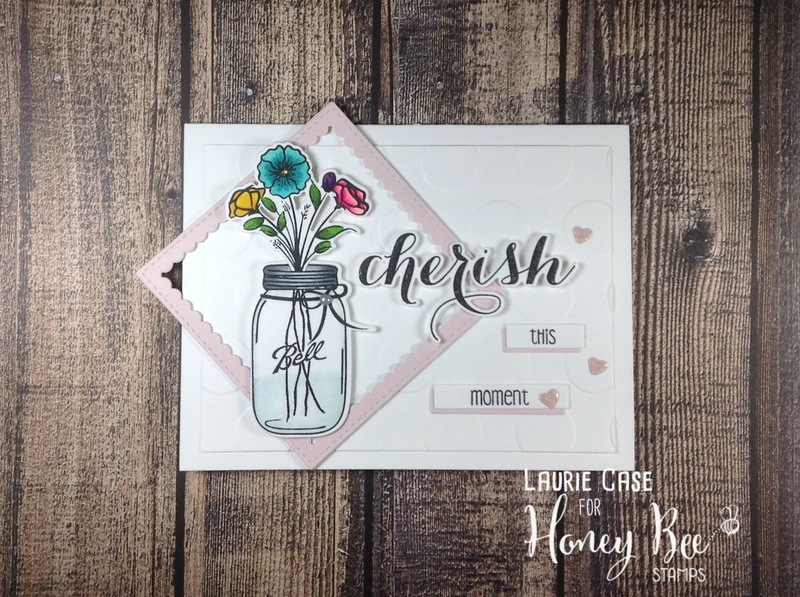 I used the vintage style set called Not Too Shabby and the beautiful Cherish set for the sentiment. Both these sets have coordinating dies which I also used! I first created a frame using some Square Stitched Scalloped Frame Dies from MFT. I layered multiple pieces together to create a thick frame. 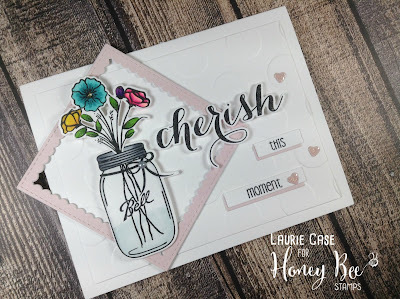 I stamped, coloured and die cut the mason jar and the bouquet of flowers from the Not Too Shabby set. I did a bit of drawing to create the illusion the flowers were inside the jar. 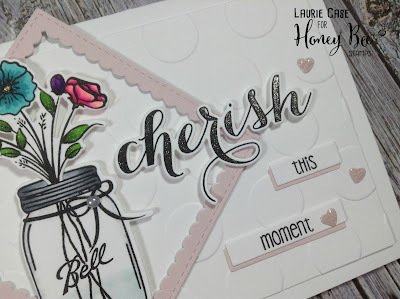 I stamped the large Cherish and used the coordinating die to cut it out. As well, I used sentiment strips to complete the sentiment. Layering these on coloured cardstock made them pop out a bit more. Before adhering everything together, I used a polka dot embossing folder on a white card panel to create a bit more dimension. 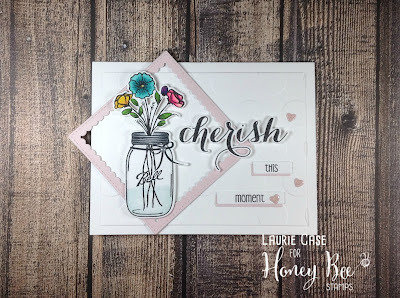 I added a little Clear Wink of Stella to make that Cherish shine and die cut some hearts (also in the NotTooShabby set) to create tiny embellishments! Combining Multiple Companies on One Card! Happy Sunday!! I hope your weekend was great!! I had a bit of an extended weekend so it was awesome. But it's come to the time of day when I'm already thinking about the week ahead and that's always a bit depressing. So to cheer myself up, I made a bright, happy card using multiple companies. I love doing this! 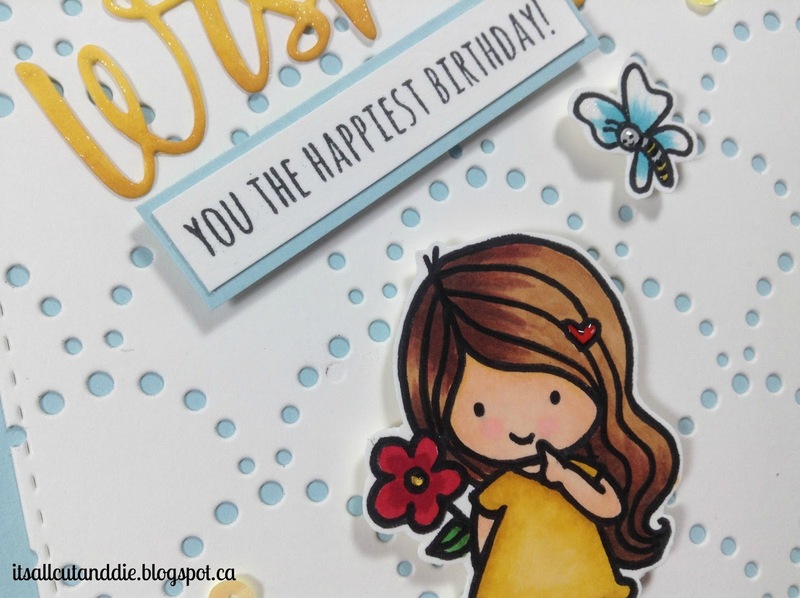 I chose the Choose Happiness stamp set today and decided to make a birthday card. 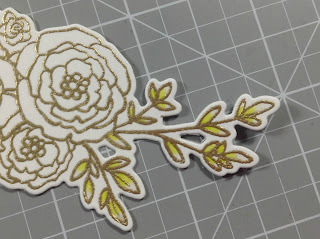 I also had a die cut piece of ivory cardstock lying on my desk for quite some time, so this was a great time to use it! 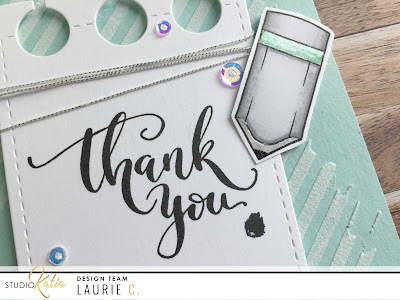 It was cut using the Dotted Scallops Cover Up Die from Lil 'Inker Designs. This is an amazing die!! In fact, she carries numerous, super unique and beautiful dies just like this one. I coloured my "happy girl" as well as the tiny butterfly and fussy cut them out. 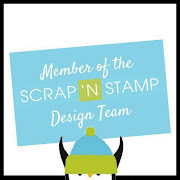 For the sentiment, I used a die set from Simon Says Stamp called Sending and Wishing. I die cut the word "wishing" from ivory cardstock and simple used my markers to color it the same as my little girl's dress. I find it easier to color by leaving the die cut in the cardstock. 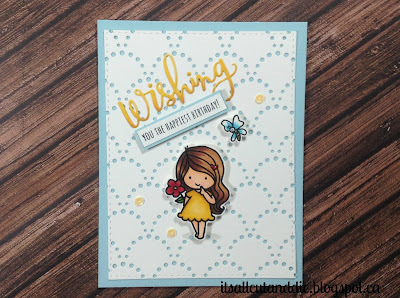 I used the stamp set that pairs well with these dies, also called Sending and Wishing! I stamped "you the happiest birthday" on ivory cardstock as well, and trimmed it out with my paper trimmer. To make it pop off the ivory background, I layered it on a small strip of blue cardstock (same as my cardbase). 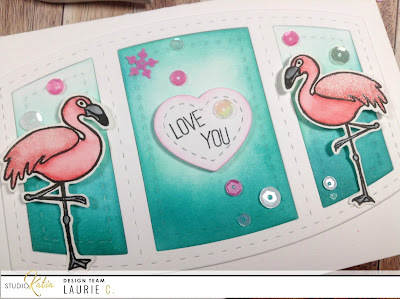 To adhere the scalloped background, I used Tombow Mono Multi Glue in the larger areas. To adhere that super delicate "wishing" I used a Zig Two Way Glue Pen. I adhered the rest of the elements with foam dots. My absolute favourite foam squares are from Best Creation in both the Large and the Small. 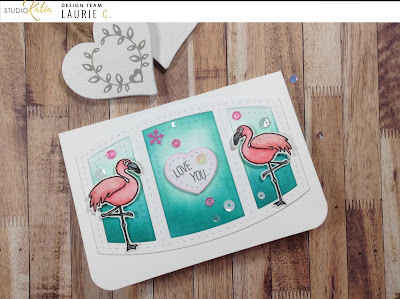 And here's a look at the finished card complete with some super cute 4mm Radiant Pineapple Sequins from Studio Katia!! Thank you for stopping by to take a look!! I hope this card made you as happy as it did me!! 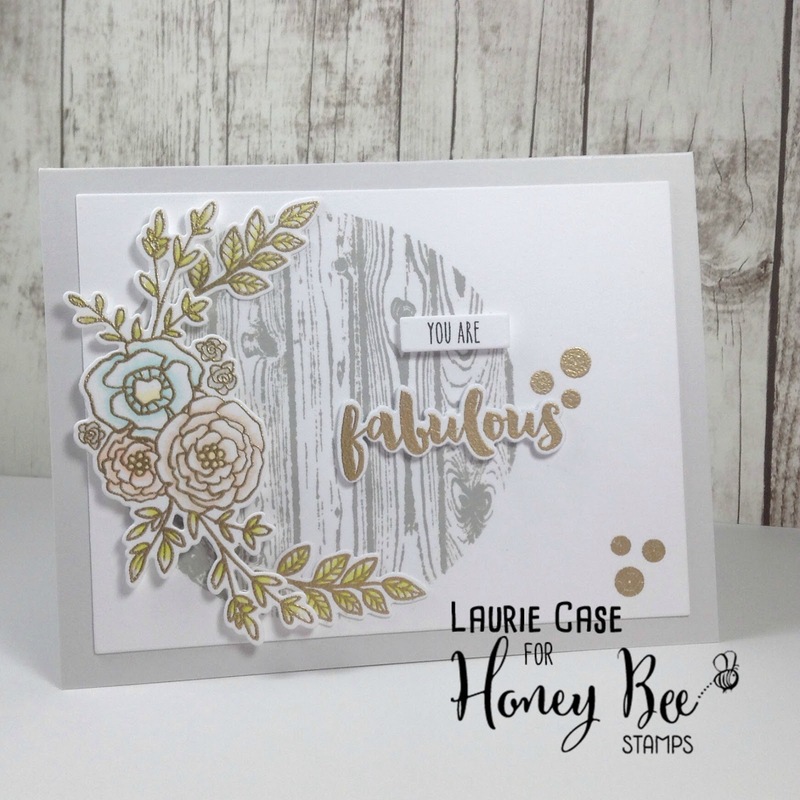 I created a card using a couple of my favourite sets from HBS in two of my favourite colours...grey and gold! I started by creating a mask out of some plain (happens to be pink) printer paper and a circle die. I used the negative piece to cover the panel I created out of white cardstock. 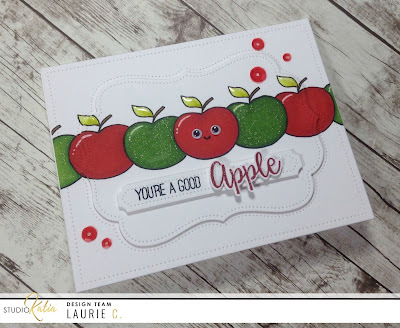 I then stamped a woodgrain background stamp overtop. This left me with a clean, circle shaped stamped area. As you can see, I stamped some images from the Country Blooms stamp set. 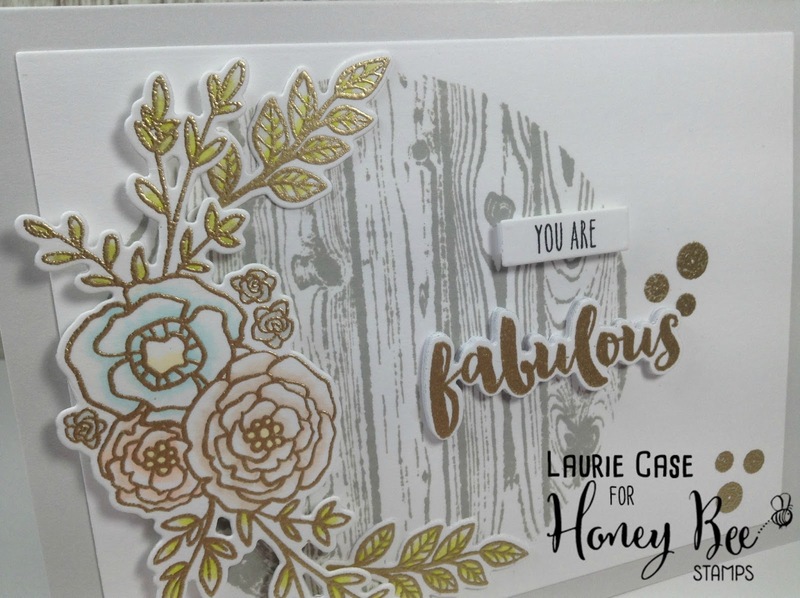 I used Versamark Ink and Gold Embossing Powder. This is one of my favourite and mostly used sets!! I used the Co-ordinating Dies to cut the images out. For the colouring I left it VERY simple. I chose the lightest shades of four colours that I had in my Promarker stash and simply blended them out with the blender marker. I did not want vibrant colours taking away from the gold embossing. You can see how faint the green leaves are. For the sentiment, I used the very first stamp set I bought from HoneyBee...Beautiful Life!!! This set also has Co-ordinating Dies which I used here. 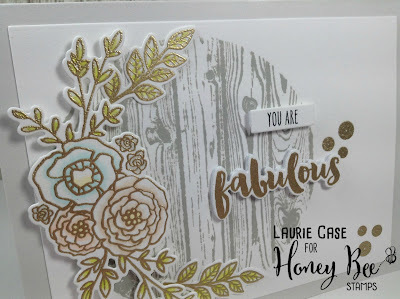 I stamped the word "fabulous" in Versamark and embossed it in gold as well. Have to keep this gold theme going!! I cut multiples of the fabulous die so I could make a very dimensional embellishment. I have a stack of scrap, inexpensive white cardstock that I use in my stamp storage pockets. I use this for things like layering dies so I'm not using up the "good stuff"! 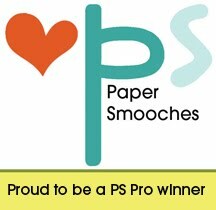 I stamped the "you are" with black ink, for a little contrast, onto a small strip of white cardstock. To put the card together, I used a combination of foam adhesive and liquid glue, but mostly foam adhesive! I surround half the stamped circle with the floral and leaf images and placed the sentiments on the opposite side of the circle. 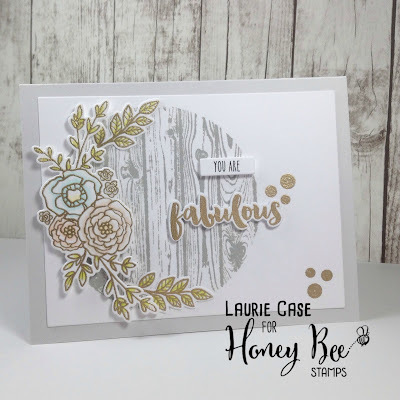 To finish off, I used the sequin stamp, also from the Life is Beautiful set in gold embossing powder to "jazz' things up a bit!! Thanks so much for stopping by today!! I hope you enjoyed! I'll be back real soon!! Welcome back!! Today's card for Studio Katia features one of my favourite sets...Pink Winter!!! I also used a stamp set from the latest release which is so adorable, Sweet Heart Candy. I started by stamping the flamingo in Intense Black ink from Simon Says Stamp (it's my new favourite black ink!). 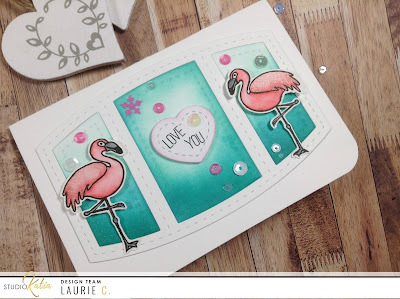 I then stamped a mirror image of the flamingo by using the backside of a large clear stamp. I used my Mini Misti for this. I placed the large stamp, face down onto the door of the Misti, then stamped the image (I found I had to use Versafine Onyx Black for this) directly on top. I then closed the door and gave firm pressure. As you can see, it took me a couple of tries to get a decent image. I used the Stitched Creative Window Die Set and cut that twice, once in white cardstock, the other in grey. I wasn't sure which color I wanted to use. I used the white cardstock inner pieces and used a few shades of teals to do some ink blending on each. I didn't like it, the pinks were WAY off! So I simply trimmed off a quarter of an inch on each end. The end size is 3 3/4 X 5 1/2 inches. I adhered the frame to the base with liquid glue as well as the inner die cuts. I adhered the flamingos with a combination of foam adhesive and liquid glue. For the sentiment, I die cut the stitched heart from the Stitched Notebook Set and stamped "love you" from the Sweetheart Candy stamps. I brushed some light pink ink around the edges. I adhered that to the centre panel with foam adhesive. And lastly, it was time for some sequins!! I, of course, used the Pink Winter Sequins Fusion!! And here's the final product!! For this weekends extra, I've used products from Right At Home and Studio Katia. I am a part of the design team for Studio Katia, it's a wonderful little online shop based here in Canada and is owned and operated by one super lady!! 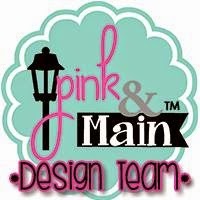 Please check out her shop, she has some amazing stamps, dies and sequins (oh my, the sequins!!!). As for Right at Home, well, I am a super fan of Nicole's stamps and dies. They are like nothing else out there. Super unique and funky! So I thought these two small businesses owned by two amazing women deserved to be paired together. I used my new favourite background stamp, the Cloud Background Stamp from RAH. I used my Tombow markers in three shades of grey and coloured them directly on the stamp. Then gave it a light spritz of water. I placed my watercolour paper directly on top and lightly pressed around. It gave a super cool effect. But I found that the lightest grey I used, showed up too light. So I just added a bit more color to these clouds. I also added touches of color to the other clouds as well because it enhanced the watercolour look. I scribbled the grey markers onto an acrylic block, mixed with quite a bit of water and flicked some droplets over the background. I, then, used a stitched rectangle die from My Favorite Things to die cut the panel. For the sentiment, I first die cut a piece of watercolour paper with the smallest of the Stitched Nested Creative Squares. 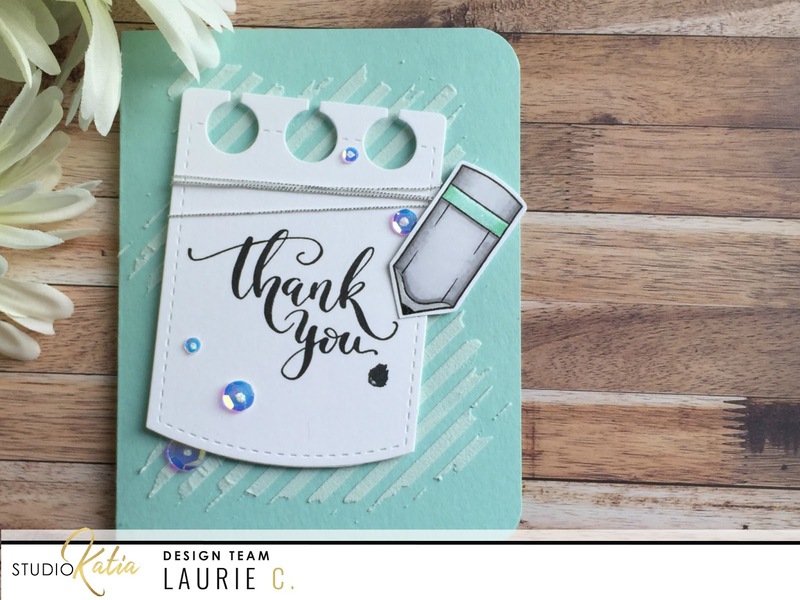 This die was the perfect fit for a sentiment from the Color In Sentiments set from RAH. I used two shades of yellow and decided it needed a little darker color at the bottom, which I added with this Tombow marker. These markers blend out beautifully. I placed the sentiment panel onto my cloud background and decided it needed a bit more yellow. I thought ribbon would be perfect but unfortunately the only yellow ribbon I have was WAY TOO yellow!! So the next best thing? Cut a thin piece of scrap watercolour paper and use the same three yellow markers to color it!! 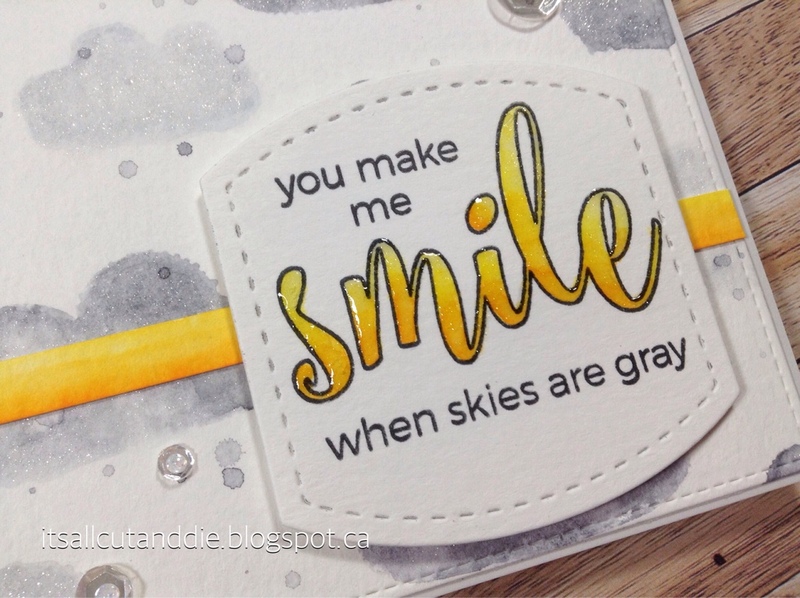 I placed the yellow strip onto my cloud panel with TomBow Mono Multi glue and adhered the sentiment with foam tape. 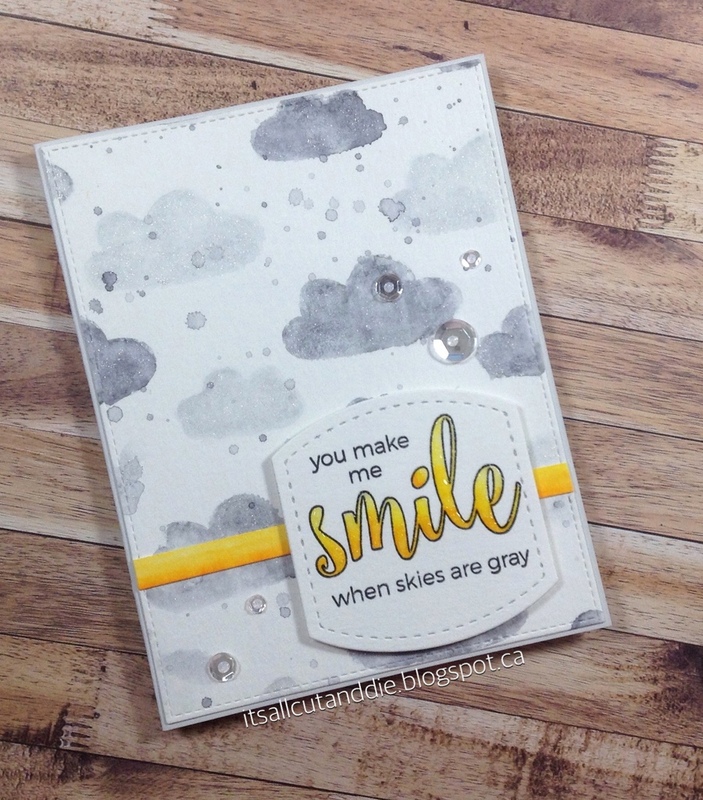 I used the Mono Multi to adhere the cloud panel onto my grey cardbase. I added some Clear Wink of Stella to all the clouds and the "smile". Next came a layer of Glossy Accents to the "smile"! It's so hard to capture the sparkle, but trust me its there!! And there it is!! My weekend "extra"! I really hope you enjoyed and I really hope you are able to check out these shops!! Thank you SO much for stopping by!! And see you soon! Hello everyone and HAPPY NEW YEAR!! I'm back to share a fun little encouragement card for Studio Katia!! I started by stamping the apple image from the Teachers Apple set onto a piece of masking paper. For this I use the full sticky Post-It Notes from 3M. They work awesome and they're cheap!! 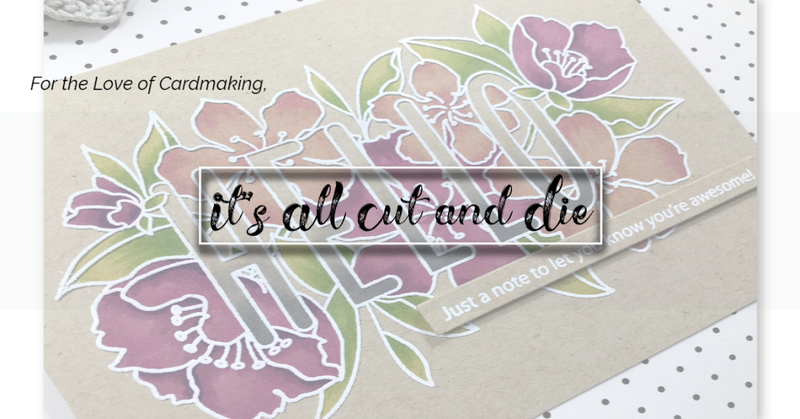 I decided to use the banner die as well for my sentiment. I adhered the panel directly to my cardbase then foam mounted the fancy frame back into its negative place. 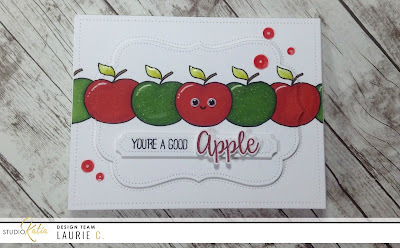 I stamped "you're a good" directly onto the banner die using black ink then stamped the word "apple" with red ink onto a scrap of white cardstock. I then fussy cut around the word so I was able to pop it up on the banner.